The Legends in Concert Las Vegas is the tribute show which has been consistent for over 30 years. This show is fascinating and features numerous tribute artists from past to present represented in this musical revue. The variety of this tribute show will keep the audience involved and upbeat while the performers will have guests believing they are watching the original artist. The show has been rated the #1 tribute concert in Las Vegas as well as other locations by numerous publications year after year. The Legend in Concert Las Vegas has a rotating cast of high quality tribute artists from the likes as Michael Jackson, Elvis Presley, Celine Dion, Britney Spears, Frank Sinatra and more. Guests can expect performances from at least four different tribute artists during each 75-minute show. The resemblance of the tribute artists along with their perfectly timed vocal renditions and accompanying dance troupes are spot on. Each performance has a live band playing on stage to add to the authenticity of the show. Each performer brings the same electricity to the stage as the original artist with fabulous choreography which includes costumes that enhance the overall production of the show. Many of the tribute artists will take your breath away and others will take you down memory road. Elvis has been known to sit on the edge of the stage and take requests thus ensuring that every show with Elvis is different. Tribute artists stick to each performer's classic songs and dance moves such as Michael Jackson moon-walking across the stage while singing Billie Jean. Lady Gaga’s performance is perfect during her acoustic version of Paparazzi and Rod Stewart sways his hips as he steps across the stage singing Hot Legs. Other artists like Barry White will get you in the mood with Let’s Get It On and Elton John will have you blasting into space during Rocket Man, while Frank Sinatra is bringing down the house with a classy version of New York New York. The line-up on a nightly basis is impressive and will satisfy any audience member that has an artist on their bucket list. The Legends in Concert moved to Tropicana Las Vegas. Although the décor is considered old-school the showroom is an ideal place with a state-of-the-art sound system that is accompanied by unbelievable multimedia and lighting effects which enhance the experience for the audience. Guests should inquire about which tribute artists will be performing on the specific date they wish to attend. This will help with any confusion of which musical geniuses from Steven Tyler to Janet Jackson to Barry Manilow will be on stage. With such a wide variety of tribute artists to choose from this event can be seen many times by patrons. 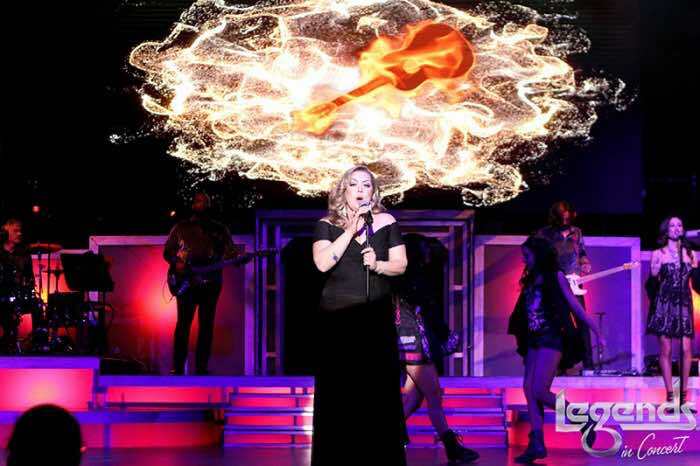 In the end, The Legends in Concert is one of the must see productions in Sin City for those people that are looking to revel in the past and present of amazing musical artists. The Legends in Concert has a reliable stable of tribute artists that rotate performances in order to keep the show fresh. The production includes 78 different iconic stars represented by over 130 tribute artists. For instance, Elvis Presley has ten different performers, Frank Sinatra has three and others stars like Michael Jackson have from one to six tribute artists. Many of the iconic stars played by the tribute artist are one-of-a-kind impersonations with remarkable accuracy in looks, moves and vocals. The Legends in Concert Las Vegas is now performing within Tropicana Las Vegas. There are a variety of performances every night except Sunday at 4:00, 7:30 Patrons must be 5 years of age or older. General and VIP Legends in Concerts Tickets are on sale now.